Career expert Kourtney Whitehead will guide you on a self-discovery journey to bridge the gap between your spiritual life and your work, and help you bring intention and satisfaction to your professional life. In Working Whole, she shares eight principles that will free you to be inspired and joyful in your life and work callings. She advises that when we commit to living our beliefs in these eight core areas (humility, surrender, discipline, gratitude, connection, love, power, and patience), we can work authentically and live fulfilled. Drawn from her long career as a recruiter, counselor, and coach and her work with everyone from new hires to seasoned executives in transition to high-achievers determining what retirement can mean for them, Kourtney shares tips and tools for handling the expectations, choices, conflicts, challenges, and opportunities we face in our work life. She leads you through a transformative experience to become more creative, energized, observant, accepting of change, and open-hearted. 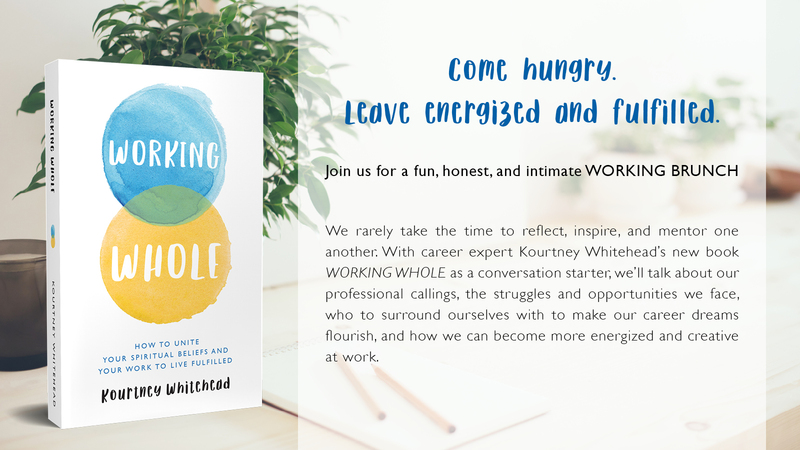 With a warm tone and featuring informative content, exploratory exercises, and actionable suggestions throughout, Working Whole provides a clear framework for making life and career decisions, both big and small, allowing you to reach your highest potential and live your most fulfilled life. Working Whole is available through all major online book retailers. Eat. Reflect. Discuss. Inspire and get inspired. Build a more supportive community for your work life through hosting a “Working Brunch.” It’s a fun opportunity to gather a small group of friends, family, or colleagues (likely at a restaurant with an amazing brunch menu!) to take the time to reflect, inspire, and mentor one another. With WORKING WHOLE as the spark, rekindle your passion for your work and talk about (in an open and non-judgmental forum) your professional callings, the struggles and opportunities you each face, who to surround yourselves with to make your career dreams flourish, and how to become more energized and creative at work. Below are several conversation starters to help you get the discussion going, and a designed digital invitation you are welcome to download. I’d be happy to answer any attendees’ questions that arise out of these gatherings and hear your feedback. You can reach me here.